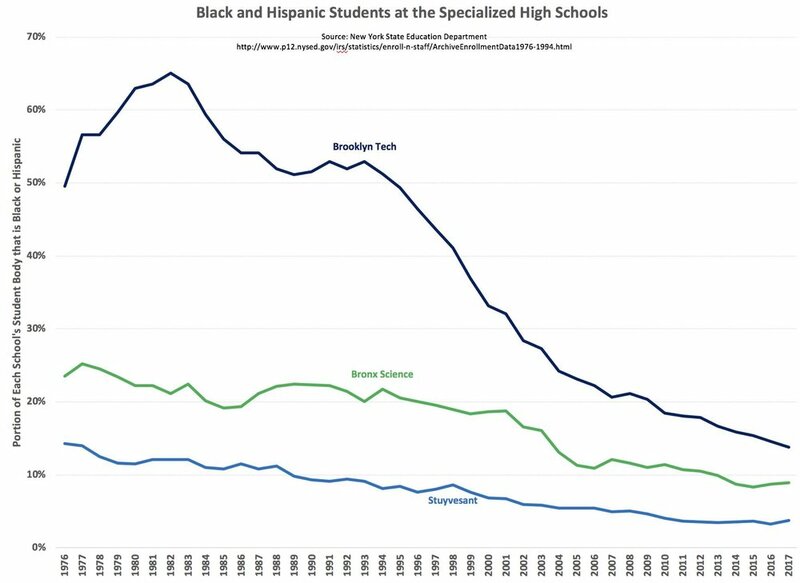 From the 1976 until early 1990s, there was high percentage of blacks and Hispanics in the three specialized high schools especially at Brooklyn Technical High School. The 20-year decline, which began in mid-1990s until today, coincides with massive cuts in tracking programs that were in every school. Honors, special progress (SP) and gifted & talented classes gave black and Hispanic students the opportunity to be grouped with fellow high achieving students at their pre-dominantly black and Hispanic neighborhood schools. These programs prepared students to pass the SHSAT and enter specialized high schools. In the 2018-19 school year, only 86 schools offer Gifted & Talented programs with around 2,800 seats. The application process requires a highly engaged parent to navigate, register and schedule their child’s testing, tour of schools and applying for available seats. Some school districts have zero or only one G&T program available. The demand for this program far outstrips supply. Many students are forced to commute long distances, even outside their home boroughs, to attend classes, placing intense hardships on already disadvantaged families. We need to restore these programs to all schools in all districts. Brooklyn Technical High School had a peak in 1980-81 of 63% black and Hispanic students out of over 5800 students. These 3,661 black and Hispanic students were more than the total 2,553 students enrolled that year at Stuyvesant High School. Sadly, diversity at Brooklyn Tech declined after the mid-90s in line with other specialized high schools as tracking programs were cut across the city and replaced with a highly inaccessible centralized Gifted & Talented program that does not meet student demand. Mayor DeBlasio and the DOE have failed to protect black & Hispanic students’ right to sound basic education as required by NY State law. New York State grade 3-8 test results show consistent multi-year high failure rates of 65-80% for black and Hispanic students. Mayor DeBlasio wasted $773MM on the failed School Renewal program. The mayor is covering up these failures by attacking specialized high schools that have been successful in educating students with highest levels of academic excellence and providing economic mobility for generations of low-income and immigrant students of all colors and backgrounds. 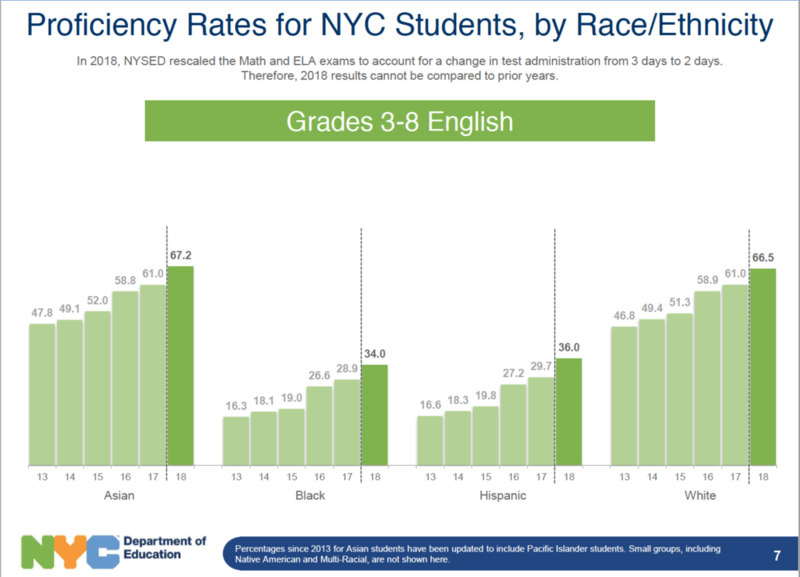 The charts below show the NYS math and ELA proficiency rates by Race/Ethnicity over several years. Low proficiency rates mean high failure rates. Even though the test has changed over the past several years, black and Hispanic students have shown continued high failure rates for both math and ELA. DOE Chancellor Richard Carranza, Mayor DeBlasio and other elected officials must be taken to task for this abject neglect of our most vulnerable students. What they should not do is to demonize and discriminate against another low-income, mostly recent immigrant minority group that also face many challenges and obstacles to equality and economic mobility.